City in southern Italy. 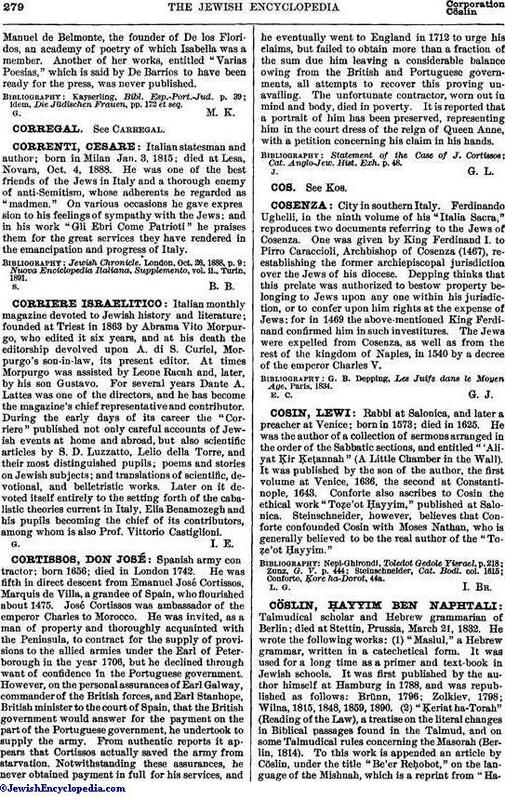 Ferdinando Ughelli, in the ninth volume of his "Italia Sacra," reproduces two documents referring to the Jews of Cosenza. One was given by King Ferdinand I. to Pirro Caraccioli, Archbishop of Cosenza (1467), reestablishing the former archiepiscopal jurisdiction over the Jews of his diocese. Depping thinks that this prelate was authorized to bestow property belonging to Jews upon any one within his jurisdiction, or to confer upon him rights at the expense of Jews; for in 1469 the above-mentioned King Ferdinand confirmed him in such investitures. The Jews were expelled from Cosenza, as well as from the rest of the kingdom of Naples, in 1540 by a decree of the emperor Charles V.
G. B. Depping, Les Juifs dans le Moyen Age, Paris, 1834.